Globe: Globe is a miniature model of the earth. Globe is fixed between two pivots. It can be rotated around the pivots. Globes come in different shapes and sizes. Globes can be very big or can be very small in size. Inflatable globes are also available. Globe is very useful while studying about the earth. The Poles: The top and bottom of the earth are called the Poles. They are similar to the top and bottom of the globe. The top is called the North Pole and the bottom is called the South Pole. Axis: The way a glove rotates around the pivots, the earth also rotates around an imaginary line. The imaginary line around which the earth rotates is called the axis of the earth. Equator: An imaginary line passes horizontally from the middle of the earth’s surface. This line is called the equator. The equator divides the earth into two equal halves. The northern half is called the Northern Hemisphere. The southern half is called the Southern Hemisphere. Parallels of Latitudes: All parallel circles from equator up to the poles are called parallels of latitude. Latitudes are measured in degrees. 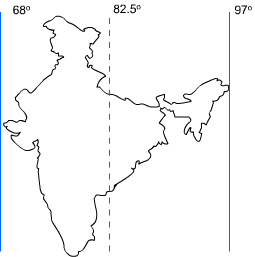 Degree of Latitudes: The equator shows the zero degrees latitude. The distance from the equator to either of the Poles is one fourth of a circle around the earth. Hence, this distance is equal to one-fourth of 3600, i.e. 900. So, the latitude of the Poles is 900. The latitude of the North Pole is 900 north and that of the south Pole is 900 south. The value of each latitude is followed by the words north, or south or N or S. All parallels to the north of the equator are called north latitudes. Similarly, all parallels to the south of the equator are called south latitudes. For example; the latitude of Delhi is about 280N. 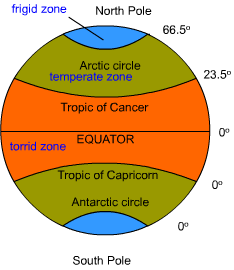 The Tropic of Cancer and the Arctic Circle are present in the Northern Hemisphere. The Tropic of Capricorn and the Antarctic Circle are present in the Southern Hemisphere. Torrid Zone: Between the Tropic of Cancer and the Tropic of Capricorn, the mid-day sun is exactly overhead at least once in a year on all latitudes. This happens because the sun rays come straight to these latitudes at least once in a year. So, this part of the earth receives the maximum heat from the sun. This zone is called the Torrid Zone. Temperate Zones: Beyond the tropics, the mid-day sun is never overhead. This happens because the sun rays come at a slant in these areas. So, this part of the earth receives mild temperature. 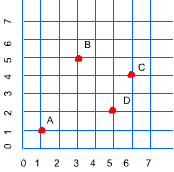 These zones are called the Temperate Zones. Frigid Zone: Areas between the Arctic Circle and the North Pole and those between the Antarctic Circle and the South Pole receive sun rays at a big slant. Due to this, the sun is never much above the horizon. So, this part of the earth receives the least amount of heat and remains very cold. These zones are called Frigid Zones. The imaginary lines which run from one pole to another are called longitudes. These are also called meridians of longitude. Unlike latitudes; all meridians of longitude are of equal length. Hence, it was difficult to decide the zero degree longitude. So, all countries decided that the line passing through Greenwich should be made the zero degree longitude. This happened because the British Royal Observatory is located at Greenwich. The zero degree longitude is also called the Prime Meridian. Furthermore, the earth has been divided into 1800 longitudes towards the east and 1800 longitudes towards the west. The Prime Meridian and 1800 longitude together divide the earth into two equal halves. Both 1800 east and 1800 west are on the same line. Latitudes and longitudes help us in finding the exact location of a place on the earth. When we say that Delhi is 280N; we are just saying that Delhi is in the Northern Hemisphere on 280 latitude. But this does not show Delhi’s position with respect to the Prime Meridian. So, we also need information about longitude to know the exact position of Delhi on the earth. Delhi is approximately at 770 E longitude. So, to give exact position of Delhi; we need to say that it is 280N and 770E. To understand this in a better way, let us draw a set of vertical parallel lines. Let us draw another set of horizontal parallel lines over the earlier set. This will give us a grid. Let us now mark the equator and prime meridian; as shown in the figure. Now, you can easily tell the exact locations of points A, B, C and D by mentioning their longitudes and latitudes. We know that the earth takes about 24 hours to make one rotation on its axis. Thus, the sunrise and the sunset easily tell us about morning and evening times. When the sun is directly overhead, it is mid-day and you can match your watch to 12 noon at this time. The sun casts the smallest shadow when it is directly overhead. But the relative position of the sun in sky keeps on changing as we move across the globe either from east to west or vice-versa. So, if it is mid-day in India, it can be another time in England. People felt a need for some standard system for keeping time. Time in different countries is fixed according to its relative position to Greenwich because the Prime Meridian passes through Greenwich. We know that the earth rotates from west to east and hence, the sun’s apparent position changes from east to west. So, Australia will witness an earlier sunrise compared to India. Similarly, the sun will rise later in England than in India. Hence, the time in Australia would always be ahead of time in India. Similarly, the time in England would always be behind the time in India. This means that when we move 1 degree longitude towards east, the time advances by 4 minute. On the other hand, the time goes behind by 4 minute when we move 1 degree towards west. India is a big country and its longitudinal span is quite large. So, there is a difference of about 1 hour 45 minute in sunrise times between Dibrugarh (Assam) and Dwarka (Gujarat). But we need a standard time throughout the country for the ease of maintaining time schedules. The Indian Standard Time (IST) has been fixed on 82.50 E (820 30’ min) meridian. The above calculation shows that the Indian Standard Time is ahead of the Greenwich Meantime by 5 hours 30 minutes. Some countries are so large that only one time zone is not enough for them. For example; there are 11 time zones in Russia. There are 9 time zones in the USA. The whole earth has been divided into 24 time zones. Each time zone covers 150 longitudes.